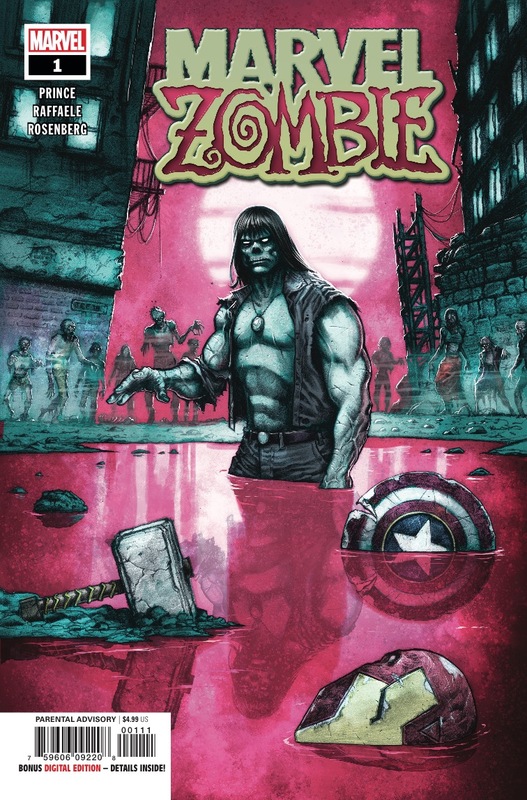 Marvel Zombie #1 Review – AiPT! Get in the Halloween spirit with a great Marvel zombie tale. The Marvel Zombies comics always seemed like a niche property. The concept felt interesting since it had never been done before, but through its sequels and spin-offs, it became clear it was more of a one-trick pony than anything else. I’m happy to report, though, that this new one-shot is actually pretty good. In a surprise to maybe everyone, this story is actually quite clever and comes through on a few twists you won’t see coming. It also keeps to its horror roots and has some rather upsetting scenes to mull over as you switch off the lights. This is an unconventional take on the Marvel Zombies and yet never strays too far from its roots. You still get plenty of characters you know and love popping up, as well as the customary gnarly murders, but at the same time, there’s a meaningful story within. W. Maxwell Prince opens the issue with the narration of a zombie and it’s not what you think. Prince plays around with the inability of the monster to talk, but also its somewhat cheery outlook on life. The character may be dead and understand the world is over, but he’s still reflective and open-minded about it all. Like other unconventional zombie stories (I’m looking at you, Fido) the story plays around with the horror tropes but also the superhero ones too. As the story progresses there’s a definitive arc to what the goal of the characters are, yet it never loses sight of a normal boy who befriends the zombie. I’ll say no more to avoid spoilers, but their bond and the similarity of their positive outlooks on life hit at the core of what this is all about. This is juxtaposed well with the still-alive superheroes, who kill any zombie on sight and would gladly blow up half a city if it meant killing more of the monsters. They’ve been changed by what they’ve lived through, but there’s a bit of hope in knowing this little boy and the zombie might be able to find greener pastures (at least psychologically) elsewhere. That makes you want a follow-up story to be sure. The art by Stefano Raffaele suits the style of the Marvel Zombies universe to a T. Detailed, gory when it needs to be, and accurate to the heroes and villains depicted within. The monotone colors by Juan Ferreyra keeps the story in a sorrowful place. The climactic turn to reach the stories end is rather frustrating. It suits the horror story angle since it means more death and dismemberment, but it also seems too easy. It also puts a hero to shame that might annoy fans of the character. I understand the point Prince was going for here, but it left me somewhat unsatisfied it had to go that route to achieve its happy ending. A good zombie issue wrapped up in a superhero universe. You can easily pick this up and enjoy it if you’ve never read a Marvel Zombies book, but you’ll highly enjoy the story here if you’re a super-fan too. The perfect Marvel one-shot for the Halloween season that puts a twist on the tired Marvel Zombies line.